I’m wondering the same thing!!!! I am a huge fan!! Did we find out if Verity will be in paperback? Is it possible that through Amazon you can make a version in Spanish? Im with Julieta. Im from argentina, and we need all your books in spanish! We love u Colleen! I hope it will be available in paperback as well! I would love to purchase a signed copy for my daughter for Christmas. Is that a possiblity? Will it be available in a tangible book form? Not sure how old your daughter is but this book is not appropriate for kids. It has very intense content. I’m such a huge fan, Colleen!!!! I want a paperback signed copy. When will it be available? Also wondering if it will be available in paperback! Will this be available on the Nook? If so when? Will this be available in paperback?? Huge fan!! I was wondering if its going to be released as a paperback? Was also wondering if or when it will be available on Nook. Love, love, love your books, I can’t wait to ready this one too!!! For all those asking Colleen has said it will be a paperback. She will be selling signed copies on her website. They will not mail till after Christmas. Hope this helps!!! I was coming on to check to see if it was listed yet. I bought the Kindle because I couldnt wait. I checked Amazon and it doesn’t seem to be there…. I guess I have to keep looking. Please tell me this will be in paperback. I just finished my Kindle version and wow. I love thrillers and this did not disappoint. Fantastic. I cannot wait for a paperback to add to my collection. When will this book be on iBooks..
Is this coming to Kobo? 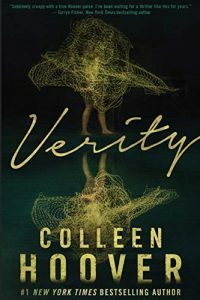 is there any possibility of verity paperback will be available in Philippines? When will this book be available to purchase on my nook? I love and have read every Colleen Hoover book. Dying to get my hands on this latest book, Verity! I just have to say that you are one of my favorite authors and you have put these two genres together in a perfect way. These are my two favorite genres and you did such a great job! Did you enjoy writing something different? Will we see more of this? I loved everything about it so I really do hope that you enjoyed writing it as much as I enjoyed reading it. Just finished reading Verity. Oh my! What an amazing story! Not usually into Rom Thrillers but as my name is Verity, I thought Its got my name on it so I best read it! So chuffed I did! Any plans to make an Audible version of Verity? I’m hoping for an Audible version, as well. When will this book be available on the Nook? I absolutely loved this book. The ending leaves it up to us to really determine if what Verity wrote was true or not but we’ll never have a true answer. I kinda love that. Will this be an audiobook? Will this be an audiobook? ?